The video below shows a false report by the local NBC affiliate in San Diego and reveals what really happened that day at the anti-Trump protest in San Diego in May, 2016. A group of four young thugs were throwing bottles and attacking pro-Trump, pro-USA demonstrators. 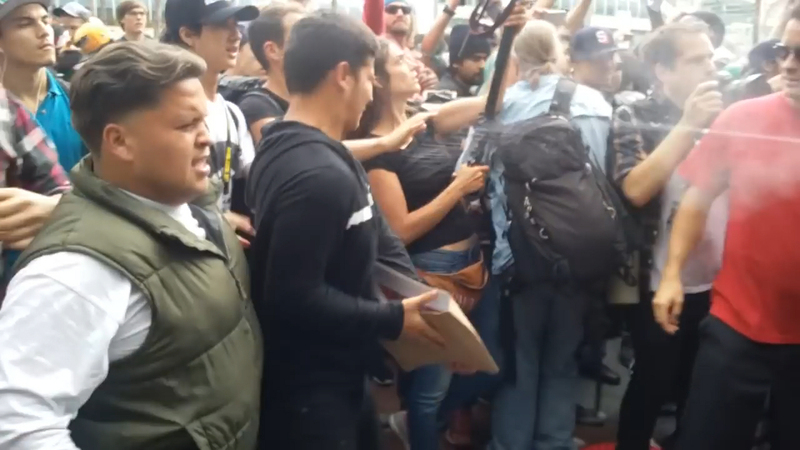 When two of them attacked a pro-Trump demonstrator and ripped up his protest sign, the two were sprayed by two persons standing next to the sign-holder in defense of the sign-holder and themselves. I was able to contact both sprayers and the sign-holder and obtain their side of the story. The sign-holder was willing to be interviewed and tell his side of the story, but NBC was not interested in correcting their story false story. The reporter for NBC was Steven Luke. My belief is that NBC management and this reporter in general were biased and just did not care about reporting the truth in this matter. See the full NBC report and video that shows what really happened in the clip below. I was also threatened with a rock by the two attackers as you see in the clip. In California this is assault. Other media and bloggers also portrayed a false version of the event and slandered the two people who sprayed the attackers. Among them were Gawker, Occupy Democrats and even the conservative blog “Red State,” whose writers have gone rabidly anti-Trump and seem quite willing to slander his followers.